Preheat broiler. 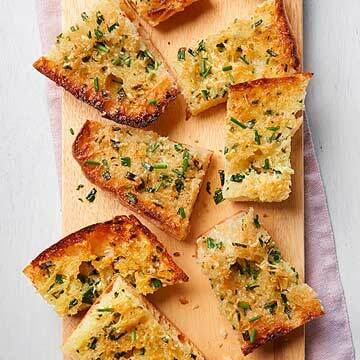 On a cutting board, mound together garlic and 3 tablespoons of the chives; sprinkle with the salt. Using the flat side of a sharp knife, scrape mixture towards edge of board until mashed into a paste. In a small bowl, stir together softened butter, olive oil, pepper and chive paste. Spread over cut sides of bread; place on baking sheet. Sprinkle with Parmesan. Broil 4 to 5 inches from the heat for 3 minutes or until golden and crisp. Cut crosswise into 8 to 10 pieces. Sprinkle with remaining chives.